What on Earth is that man mermaid hugging? And – so interesting to hear how your summer holidays differ from ours. We have the Spring Break – which is often around Easter, but varies for every school district. Then we are back to work/school full swing until Memorial Day (the end of May). THAT is the official beginning to summer. We are just getting our groove on in July and are full throttle into early September. Oh, of course – Greek Mythology. Thank you for the link. No problem. 🙂 I learned something by looking it up too. What an interesting place. I can’t imagine the eating places not being open. if they were raking in money all day, they might not have to charge so much. Too bad you couldn’t get someone to take your picture and slip in there with Julia. I suppose that some of them find it hard to get enough customers in the slow season. It depends on your definition of summer. The holiday season starts round about Easter, builds towards the school holidays (mid-July to August) and fades away in September. It typically includes rain, wind, storms and cold spells. When we have a hot, dry summer, like this year, we complain it is too hot and too dry. We really aren’t very good at summer. I am glad that I followed your redpoll link as I didn’t like to think of a restaurant hammering small birds. Being by the ocean elevates any structure, whether it has legs or not, but this pier sounds as though it has seen better days. Although certainly not during World War II. Must have been terrifying for the residents. Yes, I imagine it was. 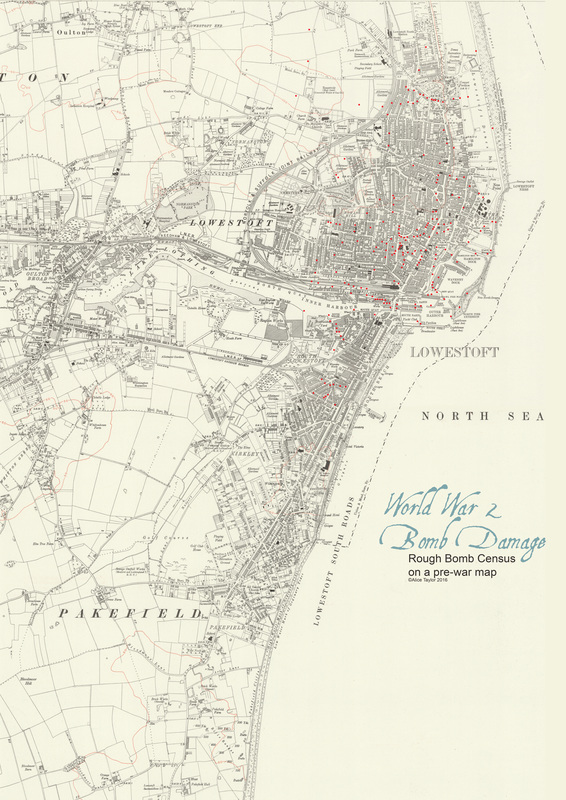 There were 105 raids on Lowestoft with 687 bombs and 4,644 incendiaries dropped. 261 people were killed and 684 injured. I didn’t include this in the post as it’s a bit of a downer. I suppose you got used to it. There wasn’t much choice. An excellent review, Quercus. A flat, legless, concrete, pier; beef jus; chips as extra. Let’s go back to the Victorian era. They must have been impressive places in their Victorian heyday.